What should I do about brown fungus on trunk of sago? Is your Sago in a container or planted in the ground? Make sure the soil is well draining. 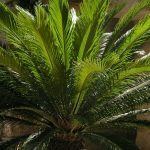 If the fungus is due to root rot, it can cause the palm to die if the issue is not corrected.